Somewhere in the countryside there is a mansion called the Mansion of the Black Death and it harbours a terrible curse that threatens to destroy all those who inhabit it. It all began with a poisoning, an unexplainable murder that shook the house from it’s sleep and lead Norimizu Rintarô and his colleagues into it. Trying to solve the mystery behind the murder they are entangled in the web of intrigue that had been spun between the heirs of the mansions former master, four foreigners who were brought to the mansion when they were still children. “Undinus sich winden; Sylphus verschwinden; Salamander soll glühen; Kobold sich mühen”. Those lines from Goethe’s Faust are the four messages that might become the key to this tragedy, but will Norimizu be able to uncover the truth behind it before everyone is swallowed up by the intense hatred buried deep within the walls of the mansion? This is the first manga I’m reviewing here, but I will probably keep doing reviews for at least the manga de dokuha series. I have to admit that I have not read the original novel yet, but as far as I can judge they probably did a very good job compressing a ~400 page novel into ~190 manga pages. The drawings are pretty intense and even if they seem cartoony at first they serve their purpose pretty well. Many scenes were overwritten in a clearly referrential way as it kept referring to other works of literature or science. 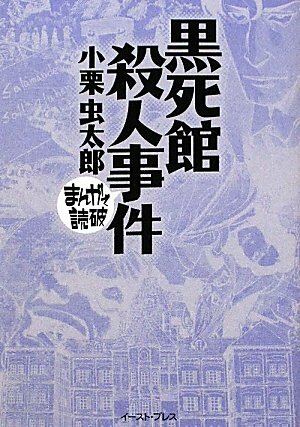 For a story that was released 1934 this almost felt like a more mature Kindaichi Shônen case without any teenagers. I wouldn’t be surprised if something like this would actually move some younger readers to try out the source material (I at least am intrigued). It was also quite interesting how they actually used the visual dimension quite well and gave some hints that couldn’t be found in the text. The solution was still pretty messed up and, even though probably overdone today, must have been quite shocking back in the days when some clichés had not been turned into clichés yet. I was surprised to see how many things, while they are pretty common today, were used back then already. Especially the use of a cross-referenced work like Faust struck me as a surprise, but still a positive one. There were so many neat tidbits along the way, I almost forgot trying to solve the murder case and when the solution came along it might not have been a surprise, but it was still tragic. I would recommend the manga-version of kokushikan satsujinjiken anytime, it’s not only a nice visual adaption, it actually adds to the experience and makes one of the basic works of weird detective fiction an even more enthralling read. ~ by seizonsha on 2010/12/18.